In this week's edition of Awards Watch, Cliff Corcoran crowns Jason Kipnis as the new leader in the AL MVP race, but Miguel Cabrera is hot on his heels. Unlike in the National League, this year’s American League Most Valuable Player race has been slow to develop, but the last three weeks have seen the Junior Circuit chase come into its own thanks to big surges from two major talents. As it stands now, the AL has yet another new leader and an extremely tight top five. With the top of the NL list fairly stable thanks to two other-worldly performances, the AL is quickly emerging as the more compelling race. Note: All stats are through Wednesday, June 24. League leaders are in bold, major league leaders in bold and italics. The number in parentheses after a player's name reflects his rank on the previous list. Kipnis has avoided making an out in exactly half of his last 230 plate appearances (not counting the one time he reached on an error in that span) and has hit .415/.500/.627 since the calendar flipped to May. In June, he has failed to reach base just once in 20 games and will carry a 19-game hitting streak into Cleveland’s weekend series in Baltimore. Kipnis doesn’t have the best raw batting line in the league, but when you factor in the standard for offense at his position and his outstanding play in the field, he rises to the top. Remember this guy? It’s hard to believe Cabrera hasn’t appeared in an in-season Awards Watch column since he last won this honor in 2013, but it’s true. He had an off season by his absurd personal standards last year (.313/.371/.524 with 25 home runs, the last the lowest full-season total of his career), which resulted in a ninth-place finish in the AL MVP voting, his worst showing since '08. He has rebounded fully in his age-32 season this year, however, leading the AL in on-base percentage, slugging, OPS (1.045) and OPS+ (188). In terms of raw production, he has been the best hitter in the AL this season. The only reason he trails Kipnis in these rankings is the significant difference between the two in both fielding and the offensive standards of their respective positions. • CORCORAN: Which players are likely next to join A-Rod in 3,000 hit club? Only Kipnis is saving us from yet another Trout vs. Cabrera debate right now, and I’m sure there are those out there who would quibble with my placing the athletic centerfielder behind the lumbering first baseman here. From my perspective, the 72-point difference in on-base percentage is too much for Trout’s play in the field to overcome, but the two rivals are closer in these rankings than the batting lines listed above might suggest. Donaldson was neck-and-neck with Trout at the top of this list three weeks ago, but his bat has gone cold over the Blue Jays’ last dozen games. Donaldson is just 7-for-44 (.159) over that span and has gone 56 plate appearances since his last home run. He’s still playing sparkling defense, of course, as evidenced most recently by this dive into the stands on Wednesday to preserve what was, at the time, a perfect game bid by Marco Estrada that had reached the eighth inning (though I’d still like confirmation that the little kid in the black t-shirt in the front row that Donaldson absolutely flattened is okay). Three weeks ago, Donaldson was jockeying for position as the best player in the AL. This week, he’s barely holding onto the title of best third baseman in his own division thanks to a monster month of June from the 22-year-old Machado, who is arguably even better in the field. He also leads Donaldson in batting average and OBP and has 11 steals in 12 attempts; those extra bases are helping him close an already narrow gap in slugging. Let’s put Harper’s current numbers in context. A qualified hitter has slugged .719 or better in a season just 25 times in major league history. The last to do so was Barry Bonds in 2004. The last to do so and not be associated with performance enhancing drugs was Frank Thomas and Jeff Bagwell in the strike-shortened 1994 season. The last to do so without the taint of PEDs in a season that wasn’t shortened by a strike was Ted Williams in 1957. Then there is Harper’s OPS+, which is a major league-leading 221. A qualified hitter has posted an OPS+ of 220 or better just 18 times in major league history. The last was, again, Bonds in ’04. Prior to Bonds’s late-career surge, the last were Williams and Mickey Mantle in '57. Given all of that, it seems unlikely that Harper will maintain those ridiculous numbers through the end of the season, but then look at his Last Three Weeks line above. His production is not abating. • JAFFE: Is Tim Lincecum losing his hold on a rotation spot? 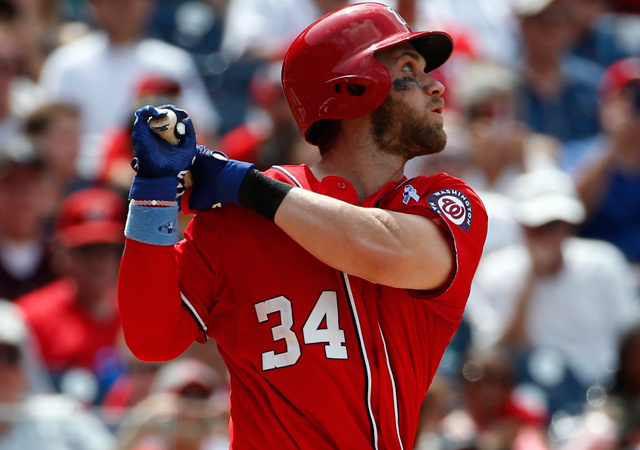 ​Goldschmidt is effectively playing Lou Gehrig to Harper’s Babe Ruth this season. That’s no exaggeration, either: Harper is a rightfielder with Ruthian numbers, while Goldschmidt, a first baseman, has stats that are a near match for Gehrig’s 1937 season. The difference is that Goldschmidt is a better defensive first baseman than Gehrig was and is adding extra value on the bases, stealing 12 bags in 16 attempts (a 75% success rate). As great as Harper has been this season, Goldschmidt’s tremendous performance gives him little room for error in this race. Frazier has been Mr. Everything for the Reds this season, getting it done at the plate, in the field and on the bases. He leads the majors in total bases. Only Harper and Goldschmidt have higher slugging percentages among qualified major leaguers, and only Giancarlo Stanton and Harper have hit more home runs. Frazier’s OBP may be a bit underwhelming for an MVP candidate, but only Harper, Goldschmidt and the Cubs' Anthony Rizzo have a higher OPS or OPS+ than Frazier’s .981 and 166, respectively, among qualified NL hitters, and Frazier is more valuable on the field and has been a more efficient base stealer than Rizzo this season. Scherzer wasn’t going to drop on this list after turning in arguably the best back-to-back starts in the last 100 years, including his no-hitter last Saturday in which he came within one out of a perfect game. In those starts against the Brewers and Pirates, he allowed only a bloop single, a walk and an infamous hit-by-pitch in the course of shutting out both teams, striking out 26 along the way. However, in his start before that, he gave up four runs in a loss to the Yankees. Given the quality of the seasons being enjoyed by the players above him, he wasn’t going to move up, either. Despite slumping over the last three weeks, Pederson just edges out Rizzo and Stanton for the final spot on this list. That’s in large part due to the two aspects of Pederson’s game that didn’t slump over the last three weeks: his OBP (he has reached base in 33 of his last 35 games) and his play in centerfield.